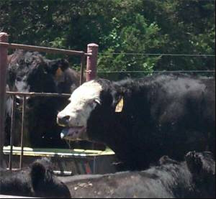 Symptoms of Stage 5 heat stress in cattle include open-mouthed breathing with tongue protruding, and possible drooling. In Stage 6, the most intense, the animal's life is in danger. Certainly it is possible to create a severity ladder for the behavioral indicators of chronic workplace stress. It would be most useful for diagnosing the health of the working environment. Photo courtesy U.S. Department of Agriculture Agricultural Research Service. When working conditions degrade gradually enough, we tolerate them even though they're intolerable. The cost is chronic high-intensity stress. We become short with each other. We hurt each other. Productivity falls. Quality degrades. Worst of all, we take our troubles home, which can spread the misery and which limits our ability to recharge and repair. To regain control, we must recognize the indicators of chronic high-intensity stress. Here's a little catalog. …someone asks you for comfort about being stressed, and you blow your top. …you add to your to-do list stuff you've already done, just for that feeling of accomplishment when you check it off. …you suddenly realize that although your desk is usually neat, it's been an unholy mess for three weeks and you never noticed. …you suddenly realize that although you usually don't mind a messy desk, you now feel an overwhelming compulsion to clean it up. …you suddenly realize that 40% of what you've eaten today contains some form of chocolate. …you no longer feel the effects of consuming two espressos before 8 AM. …you take a ten-minute break to relax, but after minute three, all you can think about is whatever you were taking a break from. …sleep mostly consists of waiting to get up until some hour that you think most people would consider reasonable. …you believe that even if you nod off in a meeting, nobody notices, because you do it cleverly. …things that used to be only mildly annoying are now unbearable. …things that used to be unbearable are only mildly annoying compared to the really idiotic stuff that's happening now. …everyone around you seems totally stressed, but you think you're absolutely fine. …everyone around you seems calm, but you think it's because they haven't yet grasped the reality of the situation. …you thought you were decisive before, but now you're making decisions before you realize you've made them. …when you have to decide something, all you can do is dither about it endlessly. …you feel an irresistible urge to make decisions that aren't yours to make. that aren't yours to makewherever you were going, you can't remember why you went there. …even though you're not a VIP, the conference room goes all quiet the moment you enter. …it isn't just that you couldn't keep the thread of what she was saying, it's that you couldn't keep the thread of what you were thinking. …you bite someone's head off over something they had nothing to do with. …two hours late, you realize you missed lunch. …two hours to go, and all you can think about is lunch. ..you've finally figured out how the whole thing fits into a nice, neat pattern. …you believe that you could actually save the company if only they would do it your way. Would you like to see your comments posted here? rbrenUyETSoazJGiPYHjlner@ChacEqZiHAlNMqPebkqIoCanyon.comSend me your comments by email, or by Web form. I offer email and telephone coaching at both corporate and individual rates. Contact Rick for details at rbrenXcEKCfGEnfSUknEyner@ChacCAlLdmBRVFOcfYtLoCanyon.com or (650) 787-6475, or toll-free in the continental US at (866) 378-5470.